The Annual General Meeting was held at the Histon & Impington Recreation Grounds on December 9th. At the meeting the Membership Fee for 2019 was confirmed at � 20 for Adults and � 6 for Juniors. Fees are due on 31st December 2018. There were no new nominations for the Committee and the current members were therefore re-elected. Following the meeting Members and Guests enjoyed our traditional Mince Pies and Coffee, although for once we were not shivering at the lakeside! This year we were again invited to attend the Godmanchester Gala. Unfortunately, it was on the same day that some football team played a match they were not expected to qualify for, so I was told umbers were not as good as usual, although there was a TV in the beer tent. We arrived about 11.30 or so to set up. We had been given a very nice awning and plenty of tables near the river bridge, under the shade of a large tree, excellent! 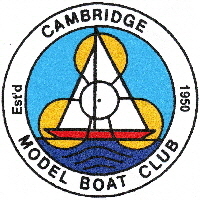 The members attending were myself, Paul and Iris and Chris and Mo, We had bought a wide selection of models from sailing craft to destroyers, all of which attracted lots of interest and comments from the public, young and old. Several had questions about how we had built the boats, and how they were sailed. Paul even managed to hand out a couple of membership application forms. In the afternoon, Chris and I scrambled down the river bank , the water level being very low, and sailed my Air Sea Rescue launch for some time, which drew a small crowd near the river bridge, and more questions, which we answered to the best of our ability! A worthwhile day, I hope a few more members will be able to attend next year. to 31st December 2018. The next AGM will be combined with the Mince Pie & Coffee Morning and held at the Recreation Ground. The date will be confirmed later in the year. The minutes of the meeting will be published in the next Newsletter.